Lock in a great price for Romantik Hotel Ahrenberg – rated 8.9 by recent guests! Room was lovely and the restaurant was a real bonus, had dinner there twice, food excellent, wait staff superb. Beautiful location. Wish we had time to explore but needed the time in Allendorf. Everything was perfect friendly meet and greet balcony room with a view to die for ,restaurant overlooking the valley was superb and food good breakfast was exceptional why can’t we do this in England? Excellent food, great view and good sized car parking spaces. Helpful staff, clean quiet location. Good breakfast, nice coffee, and tea/coffee in the room. Room was excellent. Really comfortable, warm (i traveled on November). Schöne Lage auf dem Berg mit Blick übers Tal. Hervorragendes Frühstück. Sehr freundliches Personal. Schönes Ambiente. Das Zimmer war sehr groß. Den Kindern gegenüber sehr kulant. Eine sehr angenehme Atmosphäre. Die Zimmer waren sehr schön, modern und sauber und groß. Das ganze Ambiente ist unglaublich harmonisch. Das Personal aufmerksam und stehts freundlich und zuvorkommend. Freu mich schon auf das nächste mal !!! Ein Ort der zum verweilen einlädt. Sehr nettes Personal, die Chefin kümmert sich gerne persönlich um Anliegen der Gäste und ist sehr zuvorkommend. Sehr schönes Hotel, alles sauber. 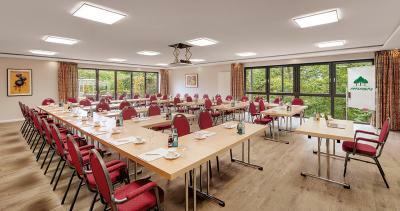 Romantik Hotel Ahrenberg This rating is a reflection of how the property compares to the industry standard when it comes to price, facilities and services available. It's based on a self-evaluation by the property. Use this rating to help choose your stay! 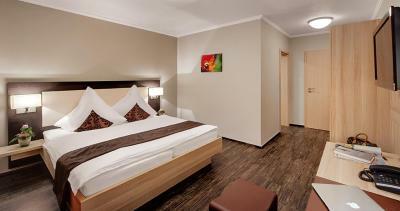 The bright rooms at Romantik Hotel Ahrenberg are equipped with satellite TV and private bathroom facilities. Hearty regional cuisine is served in the modern, country-style restaurant and the meals are prepared using local ingredients and fresh game meat. 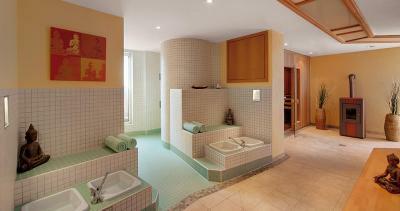 Guests can relax in the hotel’s spa area, which offers a sauna, steam room and relaxation area. 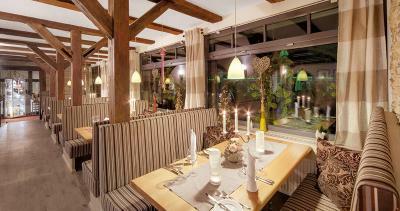 This hotel is located in the heart of Germany, with the A7 and A38 a 30-minute drive away. Free public parking is available. 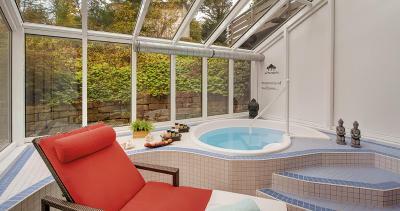 This property is also rated for the best value in Bad Sooden-Allendorf! Guests are getting more for their money when compared to other properties in this city. 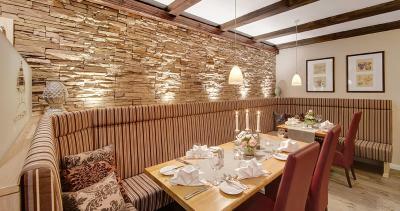 When would you like to stay at Romantik Hotel Ahrenberg? Classic room with satellite TV and a private bathroom. No extra beds are available. Pets are not permitted in this room category. This room features extra space and a balcony with lovely views of the valley or the forest. An extra bed is available on request. This room with a terrace is a 2-minute walk from the main building. It has a quiet forest location. This business single room offers a bath, 2 telephones, a modem port, satellite TV, a safe, a coffee machine and a large desk. House Rules Romantik Hotel Ahrenberg takes special requests – add in the next step! 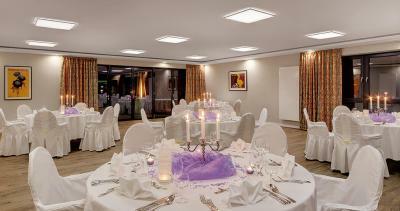 Romantik Hotel Ahrenberg accepts these cards and reserves the right to temporarily hold an amount prior to arrival. I had booked including my wife but due to illness could not attend The room I was allocated was at the rear by car park. I would like to return @ some point BUT only if guaranteed a FRONT FACING room. Location & being able to eat on terrace. Typical German oversized square pillows! Not the hotels fault, just a cultural thing all over Germany. Weak wifi connection, i stayed at room 32 but was not able to get connection.